Eczema is an itchy, scaly skin rash that occurs commonly in children but also occurs in adults. When you have eczema, you develop patches of red, cracked skin that sometimes weep clear fluid. The condition, also known as atopic dermatitis, affects 10 percent to 20 percent of young children. And about seven percent of adults will experience a bout of eczema over the course of their lives. Eczema treatment usually starts with skin creams that contain corticosteroids, which work to calm the inflammation on your skin. If those don't work, your doctor may prescribe stronger corticosteroids that you take by mouth. In severe cases, physicians may try other drugs that suppress the immune system reaction that causes the skin inflammation. However, there may be another alternative for people seeking eczema treatment. The skin condition appears to be linked to celiac disease and to non-celiac gluten sensitivity and a gluten-free diet—the treatment for both of those conditions—may, in fact, help treat eczema in some people. It's not clear what causes eczema, but the skin condition appears to result from a combination of genetic predisposition and environmental factors. People with eczema seem to have both lower levels of a type of protein that's associated with a healthy immune system plus higher levels of a protein that's involved in allergic reactions. Some physicians consider eczema an autoimmune condition, which means it involves your immune system attacking your own healthy tissue by mistake. Researchers have compared the prevalence of eczema in people who also have celiac disease to eczema prevalence in control subjects. They've found that eczema occurs about three times more frequently in celiac disease patients and about two times more frequently in relatives of celiac disease patients, potentially indicating a genetic link between the two conditions. Non-celiac gluten sensitivity is not as well understood as celiac disease. However, researchers who are studying it say that symptoms include digestive issues, such as diarrhea, constipation, pain, and bloating plus other symptoms, including brain fog and skin conditions. Eczema has been associated with gluten sensitivity. Specifically, one 2015 study looked at 17 people with non-celiac gluten sensitivity who had skin problems, including rashes that looked like eczema, dermatitis herpetiformis, and psoriasis. The study found these people's skin improved significantly within about one month when those people adopted the gluten-free diet. It's possible that a strict wheat-free or gluten-free diet could help treat some cases of eczema, both in those with celiac disease and in people with gluten sensitivity. In one study, Finnish researchers looked at candidates for eczema treatment who had suspected wheat allergies but not clinically confirmed celiac disease. Their aim was to identify the specific fraction of wheat causing eczema (which turned out to be gliadin, the toxic protein fragment in celiac disease). They found that four of the six adult eczema patients studied successfully treated their eczema by eliminating grains from their diets. Another British study looked at the overall prevalence of immune system disorders in patients with celiac disease and found that about five percent of celiac disease patients also had eczema. Two of these patients, out of a total of 17, had "dramatic and persisting relief from their rash when on [the gluten-free] diet," the study reported. Is a Gluten-Free Diet Considered an Eczema Treatment? In these studies, the gluten-free diet helped some, but not all, eczema patients control their symptoms. So should you consider a gluten-free diet as eczema treatment? 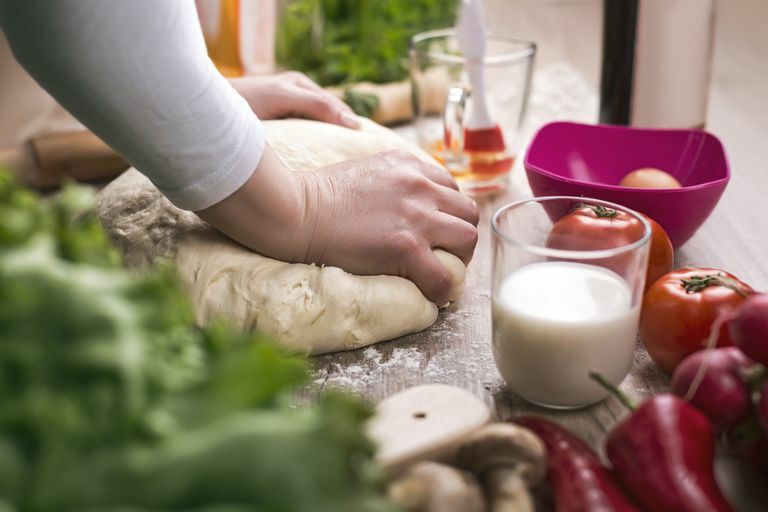 If you've just been diagnosed with celiac disease and you also have eczema, you may find that you resolve some or all of your eczema symptoms with a gluten-free diet. In addition, since eczema and celiac disease appear to be related genetically, and since both run in families, you may want to consider celiac disease testing if you have eczema and are related to people who have celiac disease. If you have eczema along with celiac disease symptoms, you definitely should get tested for celiac disease, since you're already at a higher risk for the condition. Again, if you do turn out to have celiac disease, as a bonus you may find that the gluten-free diet helps to clear up your eczema symptoms. If you've finished with all the medical testing you wish to have for celiac disease (regardless of whether you've been diagnosed with the condition), you might want to consider trying the gluten-free diet on a trial basis for several months to see if it helps with your eczema. Just remember, for the diet to work, you'll need to follow it strictly without cheating. Atopic Dermatitis. National Institute of Arthritis and Musculoskeletal and Skin Diseases. Catassi C. Gluten Sensitivity. Annals of Nutrition and Metabolism. 2015;67 Suppl 2:16-26. Ciacci C et al. Allergy prevalence in adult celiac disease. Journal of Allergy and Clinical Immunology;113(6):1199-203.
Cooper BT et al. Coeliac disease and immunological disorders. British Medical Journal. 1, 537-539. Varjonen E. Antigliadin IgE - indicator of wheat allergy in atopic dermatotis. Allergy;55(4):386-91. Will Eating Gluten Raise Your Risk of Alzheimer's Disease or Dementia? What Is Gluten and Why Is It So Hard to Avoid? Could the Gluten-Free Diet Help to Treat the Devastating Disease ALS?